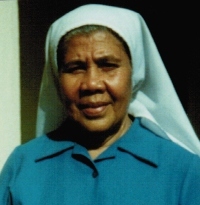 Sr Monika Melesete TOFAEONO died on 14 May 2013 at the Rest Home – Maota Marista, Vailoa, Samoa at 9.15pm, with her Sisters and relatives at her bedside. The Sisters had kept night vigil and were present when her Lord and God came to take her to himself. Sr Monika was born in Siumu, Safata, 30 October 1923, the daughter of the late Tofaeono and Malia Fesilafai. She had seven siblings, two sisters and five brothers, her eldest sister who is ninety couldn’t attend her funeral due to health problems, but surely she was with her in spirit. Many nephews, nieces, cousins and friends survive her as well as her Marist Missionary sisters. Sister Monika brought joy, dedication and prayer with an extraordinary gift of Mary’s presence wherever she was missioned and loved by all. She was professed in Moamoa on 12 September 1950, and that was her first mission appointment after profession. Sr Monika spend most of her Missionary life as a pastoral worker in different parishes, she was responsible for the young girls who were interested in the children of Mary, she was also involved with the Sunday Schools where she spend most of her time, not only in Samoa but New Zealand and Tokelau as well. On 12 October 1973 she was missioned to Auckland and worked as a Social Worker for the Samoans, she continued to take interest in teaching and organising the Samoan Sunday School Programme as well as working with the Children of Mary in different parishes. Sr Monika was dedicated in serving and helping people who were very much in need with the help of the smsm sisters in the community at the time. She had started many associations of the children of Mary in Auckland. No doubt that Sister Monika has planted the faith in the hearts of the people whom she served unceasingly. She was a brave woman with so much enthusiasm to serve God faithfully in the spirit of Mary through the Congregation. She loved her Marist vocation and always was so interested in anything to do with the congregation. Sr Monika returned to Samoa in 1984 and taught at Sacred Heart school, Safotu and from then on she was doing a variety of simple community services in different places where she was assigned, until she felt the need to spend most of her retirement at Maota Marista – Rest Home, where she enjoyed the peace and tranquillity of the environment. Sr Monika endured so much pain and suffering during her time of illness and eventually she needed more intensive care, gradually lost her physical independence but she never lost her independent thinking. She would always give a nice smile and never missed to say thank you to anyone who would there to give a hand. She was a woman of perseverance and consistency. We believe that Sr Monika was ready to meet her God after her many years of fidelity as a Missionary Sister of the Society of Mary.